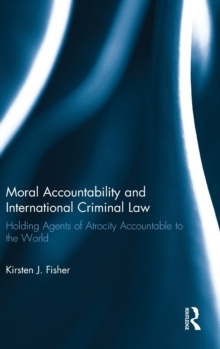 This book examines international criminal law from a normative perspective and lays out how responsible agents, individuals and the collectives they comprise, ought to be held accountable to the world for the commission of atrocity. The author provides criteria for determining the kinds of actions that should be addressed through international criminal law. Additionally, it asks, and answers, how individual responsibility can be determined in the context of collectively perpetrated political crimes and whether an international criminal justice system can claim universality in a culturally plural world. The book also examines the function of international criminal law and finally considers how the goals and purposes of international law can best be institutionally supported. This book is of particular interest to a multidisciplinary academic audience in political science, philosophy, and law, however the book is written in clear jargon-free prose that is intended to render the arguments accessible to the non-specialist reader interested in global justice, human rights and international criminal law.